I am not really one for the beach, but when one is on holiday en famille, it’s sometimes necessary and I prepare for an expedition. So: sun block, yes, beach towels, yes, beach umbrella, yes, book . . . ah, that’s not so easy. I won’t be taking my e-reader as it’s too likely to get sand in it. Books do tend to get bashed about a bit on the beach, so I won’t be taking anything I mind about. I’ll keep my pristine new paperbacks for reading elsewhere. It’ll be one of the books from the Oxfam shop, then, but which one? It should be entertaining – that goes without saying – but not too demanding. I will be interrupted by requests that I assist with castle-building, or go paddling, or buy ice-creams, or, who knows, I might even be tempted to have a dip myself, so it needs to be something I won’t mind putting aside for a while. 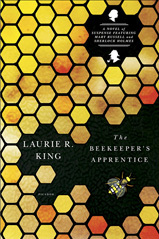 On this particular day, the book that went into the bag was Laurie R. King’s The Beekeeper’s Apprentice, the first in her series featuring Mary Russell and Sherlock Holmes. I had dismissed it as something that wasn’t for me. Sherlock Holmes falling in love and getting married? No! But then I saw it in Oxfam, and thought, well, maybe . . . After all, I do like a good Sherlock Holmes pastiche. And, of course, I loved it. The tone is exactly right, the plot threw up a breath-taking surprise, and towards the end, I minded very much putting it down. I’m looking forward to reading the sequels. And I won’t be waiting for them to turn up in the Oxfam shop.